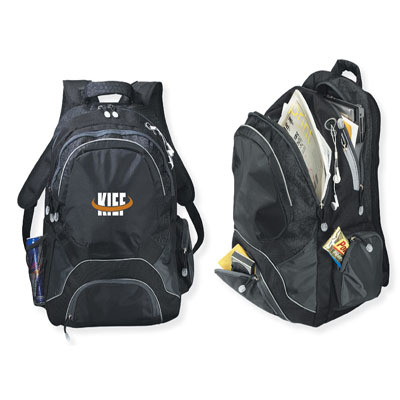 Two front zippered compartments, highly functional organizer panel, two main zippered compartments with padded laptop pocket, zippered side multi-medium pocket, mesh water bottle pocket, padded back and adjustable straps, zippered MP3 compartment with headphone port, carrying handle. Size: 13" x 19" x 6". *There is a 8 % surcharge on the price of this calendar if it is shipped to California, Tennessee, or Maryland, so the price per calendar shipped to these states will be 8 % more than you see on the website. This surcharge will not be reflected on the order form, but will added to your total and charged on your credit card. Imprint Area is: 4" x 4"
50 1 color(s) imprint at $1,500 ONLY $30.00 each. 50 2 color(s) imprint at $1,572 ONLY $31.44 each. 50 3 color(s) imprint at $1,644 ONLY $32.88 each. 150 1 color(s) imprint at $4,244 ONLY $28.29 each. 150 2 color(s) imprint at $4,369 ONLY $29.13 each. 150 3 color(s) imprint at $4,495 ONLY $29.97 each. 250 1 color(s) imprint at $6,812 ONLY $27.25 each. 250 2 color(s) imprint at $7,018 ONLY $28.07 each. 250 3 color(s) imprint at $7,224 ONLY $28.90 each. 500 1 color(s) imprint at $13,572 ONLY $27.14 each. 500 2 color(s) imprint at $13,932 ONLY $27.86 each. 500 3 color(s) imprint at $14,293 ONLY $28.59 each. 1000 1 color(s) imprint at $27,092 ONLY $27.09 each. 1000 2 color(s) imprint at $27,762 ONLY $27.76 each. 1000 3 color(s) imprint at $28,431 ONLY $28.43 each.